Our wines have received some amazing reviews from journalists and wine bloggers for which we are truly grateful, we believe our wines are fantastic and it is fabulous to hear that others think so too. With its fiercely independent spirit, buzzing foodie scene and an old-time English seaside charm, it’s easy to see why Brighton is one of the most popular day trips from London. Read more. 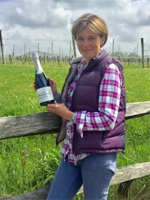 Award-winning local wine producer Alison Nightingale of Albourne Estate has launched what will be the first of a range of elegant sparkling wines from the fledgling boutique vineyard. Read more. It’s been seven years in the making, the first sparkling wine to be launched by Alison Nightingale’s award winning boutique vineyard Albourne Estate overlooking the South Downs. Read more. A Cheers for English quality. 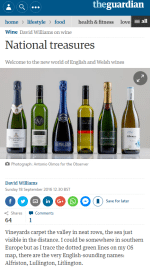 England is well known for making superb sparkling wines, and it has been showing off its best during English Wine Week. Read more. AWARD-winning wine maker Alison Nightingale has launched a range of sparkling wines from her vineyard. She planted the 30-acre vineyard at the Albourne Estate with 41,000 vines after leaving a high powered job in marketing to bring up her family. The new wine is the 2013 Blanc de Blancs, made with chardonnay white grapes and using the highest quality cuvée. Read more. One unusually bright and sunny Sunday in May, I went down to Sussex to visit Albourne Estate. Situated about an hour’s drive from London, the vineyards are in an idyllic setting amongst the green and rolling hills of southern England. Read more. 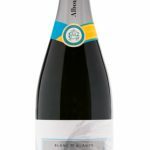 Award-winning Sussex wine producer Alison Nightingale of Albourne Estate has launched what will be the first of a range of elegant sparkling wines from the fledgling boutique vineyard. Read more. The dominance of French Champagne is under threat – from south-east England. Read more. This is a rapier sharp, tangy, refreshing Bacchus with real flair and precision and the 2015 Cellar Selection (£14.95, same merchants) is wondrous wine with more depth, richness and creaminess, destined to be served with main course fish dishes. Read more. English winemakers seem to be making something of a speciality of making whites from the red pinot noir grape, and this is beautifully done, with just a hint of pink in the colour and notes of red fruit to go with the citrussy acidity and mouthfilling texture. Read more. In Britain, the first crops of broad beans are as much a sign of spring as asparagus. Read more. What a curious wine this is. It’s got that rosé charm, but with just that something extra. Another excellent wine from Albourne. Read more. 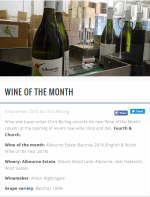 Wine and travel writer Chris Boiling uncorks his new ‘Wine of the Month’ column at the opening of Hove’s new wine shop and deli, Fourth & Church. Read more. Bacchus was not only the Roman God of Wine but it is also the name of a very useful white grape which, in the right hands, makes gloriously tangy, citrusy wines. Winemaker Alison Nightingale scooped a trophy at the UKVA Wine Competition for this epic version. Drink it with the Butter-roasted skate wing and watch it waltz through the caper and mussel ingredients with ease! Read more. Alison Nightingale celebrates as her Albourne Estate’s wine is voted England’s best. Read more. 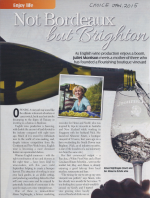 When Alison Nightingale and her husband Nick Cooper arrived in Hurstpierpoint 12 years ago, looking for a thriving village in which to bring up their young children, she could have scarcely imagined that she would end up helping to put Sussex wine on the map. Read more. 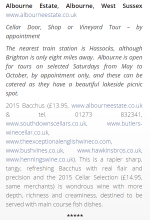 Another is the Albourne Estate Bacchus 2014 made by Alison Nightingale is deceptively light on the palate (it is 12 percent) and deliciously zingy without being overpowering. Read more. Three whites that I absolute love are: Albourne Estate’s white pinot noir 2013 (Sussex): King Fu Girl Riesling (Washington State) and Warwick Estate White Lady chardonnay 2011 (Stellenbosch South Africa). Read more. When Alison Nightingale gave up a high-flying job to open a vineyard, she never dreamt she would win awards for her wines. Read more. From Sussex – indeed the label gives the appellation as ‘Sussex, England’. This wine won a gold medal and two trophies at the English & Welsh Wine of the Year Competition 2015, sponsored by Waitrose, and it’s easy to see why. It’s light, crisp and very aromatic with strong hints of elderflower. It would be all too easy to mistake it for a Sauvignon Blanc on the nose. Read more. Alison Nightingale of Albourne Estate has won the ‘best English wine of the year’ award, despite only being in the game for two years. 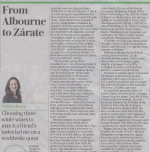 Here she tells us why Bacchus is the best British grape. Plus: our tasting notes for her award winning bottle. Read more. Wine from an Albourne based vineyard has been voted the best in England, and has won a prestigious award. 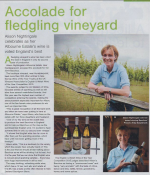 Alison Nightingale’s Albourne Estate scooped the accolade for her 2014 Bacchus in only her second year of wine production. Read more. A vineyard’s wine has been voted the best in England at a prestigious award ceremony. 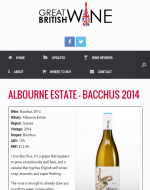 Alison Nightingale, of Albourne Estate, scooped the accolace for her 2014 white Bacchus in what is only her second year of wine production. Read more. I love Bacchus, it’s a grape that appears to grow exceptionally well here, and a varietal that typifies English still wines; crisp, aromatic and super fleshing. Read more. Next time you are choosing a wine, why not select one produced virtually on your doorstep? 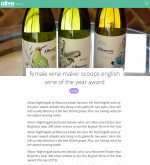 Five years after leaving a career in marketing to fulfil her dream of launching a vineyard, local entrepreneur Alison Nightingale has released her second vintage and her latest batch of Albourne Estate wines are already winning awards and rave reviews in the media. Read more. I adore Albourne Estate’s commitment to the environment. 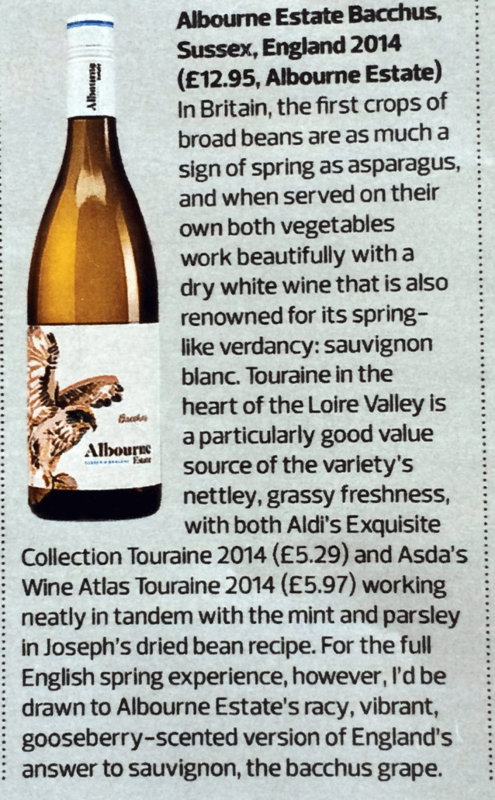 Many producers will proudly tell you of their practices and create marketing material around these, but I really feel that Albourne Estate genuinely care and put so much heartfelt passion into everything they do. Read More. As tried in the Olive test kitchen this month. Albourne Estate’s White Pinot Noir 2013, 11%, is beautifully rose gold in colour because it’s made from the red pinot noir grape, despite being a white wine. There’s a hint of fizz to it, strawberry overtones, and a clean finish. Read more. We are told never to mix wine and beer, but one couple in West Sussex is doing just that … with harmonious results. I arrive at the Albourne Estate in the midst of a minor emergency. A fox has been at the guinea pig hutch in the night and Alison Nightingale is clutching the pet while repairs are made. The challenges of running a successful vineyard are many, and especially so when it is also one’s home. Read more. 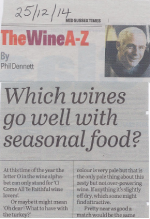 At this time of the year the letter O in the wine alphabet can only stand for ‘O Come All Yea Faithful wine lovers’. Or maybe it might mean ‘Oh dear! 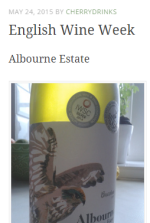 What to have with the turkey?’ One of the wines I have tasted this year that would be a good match any time is one from just down the road at Albourne Estate, just off the A23 a few miles south of Burgess Hill. Read more. 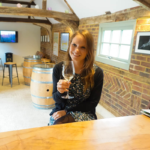 The owner of a vineyard near Hurstpierpoint is striving to win over drinkers to the delights of English Wine. 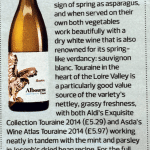 But the country’s temperamental climate presents challenges for Albourne Estate. Read more. 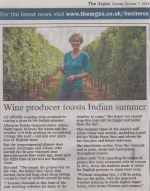 An award-winning wine producer is raising a glass to the Indian summer. 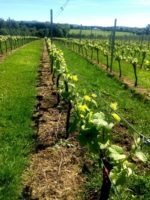 Albourne Estate vineyard owner Alison Nightingale believes the warm and dry weather will help produce an exceptional vintage this year – and win over more fans of English wine. Read more. 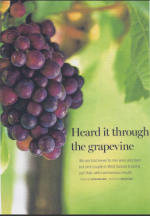 As English wine production enjoys a book, Juliet Morrison meets a mother-of-three who has founded a flourishing boutique vineyard. Opening a vineyard may sound like the ultimate retirement adventure or career switch, but it need not involve decamping to the slopes of Tuscany or investing in a chateau in Bordeaux. Read more.